Congratulations to Steve Troutman! 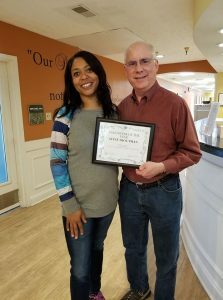 Steve was recently nominated as Hermitage Care & Rehab’s volunteer of the year. Steve is a retired school teacher from McLean County who has been volunteering at Hermitage for four years. Steve is an excellent piano player and often uses his musical talents to serve our Residents. Steve is a vital part of our Hermitage family. Hermitage is blessed to have Steve and all of our wonderful volunteers!